Here are some thoughts on some factors that seem likely to drive girls and women away from jazz education, performance, and consumption. Some of these probably effect many boys and men in the same way. These are not the only factors at work, but these one are easily fixed. I also explain some reasons why excluding girls from jazz is bad, in case any such explanation is necessary. Many kids, boys and girls, are reluctant to improvise or even afraid of it. One thing I’ve noticed over the years is that this happens when it is made a “thing”, when it is a separate and special activity apart from normal band or playing music. It also happens when it is badly taught and/or taught by people who are themselves nervous about it or can’t really do it. It can be made worse by a constant focus on it being “all about feelings” and “expressing your individuality”. Sure, those things are important to professional improvisers, but they are frightening to adolescents because they involve exposing your innermost self to scrutiny and, maybe, ridicule. Solution? Focus on skills and techniques. “If you do x, then y will happen”, “to achieve that effect, do this”. Like a recipe. 2. Instrument choice, focus of lessons, and gender. 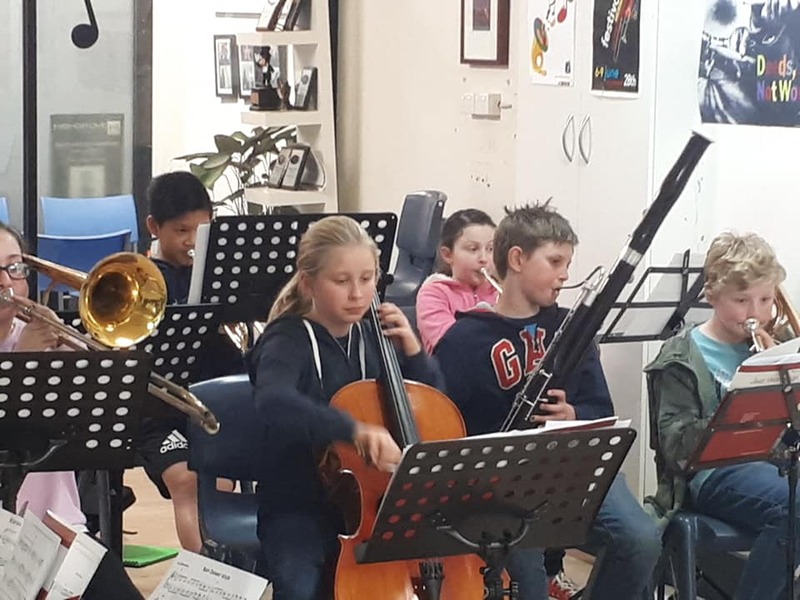 Research tells us that girls are more likely to play instruments that are not widely accepted by school band teachers as part of the regular big band (Harrison, 2007; McKeage, 2004). In the beginner band flutes may be allowed, but to progress only woodwind doubles. In addition, even if you do play a big band instrument, if you are not a serious student of jazz learning skills of improvisation at a high level, you are not going to be able to get into a uni jazz degree or get professional gigs. I know from my own music school that the majority of students who are sent by their parents to focus on jazz in their music lessons are boys. 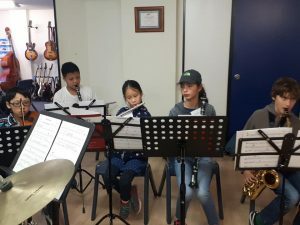 If a student only ever does AMEB-style work, it doesn’t matter what grade they achieve, they can’t play jazz at a serious level until they start to actually work at it. 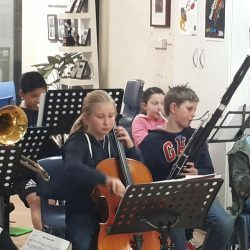 So, if girls tend to spend their primary and high school years focusing on AMEB, orchestra, and concert band, then they have little chance of progressing into professional jazz. To even get into the Con, for example, you already have to be a very good jazz player. Even if you do a classical degree, you still can’t do more than be a reader in a big band. And someone who isn’t a jazz player or a soloist is often a bit of a liability in a big band. If you can’t play jazz, then you don’t get jazz gigs. If you’ve been directed into reading-only forms of music, then you won’t be able to play jazz. You are, on the other hand, very likely to conduct school concert bands and give private lessons, all perpetuating the same cycle. 3. Why is this a problem? Of course it could be that girls and women simply are not very interested in jazz. If that is the case, then that is fine. However, there do seem to be pedagogical and structural factors that might be excluding female musicians from jazz. Conventional histories of jazz certainly present the ideal jazz great as a man; women are virtually invisible, potentially giving the impression that women are not part of that world and perhaps are unwelcome. Anecdotal reports abound of women being treated badly and harassed by male colleagues in jazz and popular music. If men see jazz as properly for men, then perhaps those with such an attitude might perceive women as out of place in the field. The anthropologist Mary Douglas found that a widespread cross-cultural definition of ‘dirt’ was ‘matter out of place’ (Douglas, 2002/1966, p. 35). Could it be that men in jazz see women as ‘out of place’, as somehow polluting, and thus in need of being cleared away? If, as it seems, girls and women are being excluded from jazz and mistreated once they are involved in it, then that in itself is problem enough. It is also a problem for a field of only marginal popular interest with a miniscule market-share of around 2% of USA digital album sales and 1% of USA streaming in 2017 (BuzzAngle Music, 2017) if 50% of the population are potentially alienated from it. A 1995 study found that jazz was unique among other ‘highbrow’ arts activities such as classical music, museum and art gallery visits in that its audience consisted of significantly more men than women (DeVeaux, 1995). Other studies have found that 74% of modern jazz CD purchases were made by men (Oakes, 2010) and that jazz festival audiences were predominantly male (Oakes, 2003). A report for the National Endowment for the Arts (NEA) in the USA found that ‘those who had more arts education were more likely to attend arts performances – a relationship which was about four times stronger than that of any other factor considered’ (Bergonzi & Smith, 1996, p. 4). While Bergonzi and Smith were not focusing only on jazz, we might extrapolate from their findings that participation in jazz education might lead to more attendance at jazz concerts and higher consumption of recorded jazz. Interestingly, they found that participation in arts education did not make it any more likely that someone would participate in arts as a performer. However, the problem remains that potentially 50% of all people are excluded from jazz education and less likely to become jazz audiences or consumers. So, quite apart from the fundamental problem of exclusion and mistreatment, jazz seems to be shooting itself in the foot by alienating a huge part of the population, something it can ill-afford. Luckily, the problems I have summarized are all easily fixed. Firstly, teach improvisation as skills, not feelings, and incorporate it as an everyday activity in teaching. You won’t stop people from having emotions, but you can stop them developing the facility to express them. Secondly, accept non-standard instruments into jazz ensembles and jazz education programs. Thirdly, men should stop seeing women as polluting or threatening, should cease harassing female colleagues and students and give up seeing women musicians in terms of non-musical things like their appearance. Fourthly, stop focusing on students’ gender as important: instead focus on the skills, techniques and procedures involved in playing jazz, manage classroom environments to eliminate harassment, and avoid making being a girl or woman playing jazz a “thing”: it is not and should not even be noteworthy. Bergonzi, L., & Smith, J. (1996). Effects of arts education on participation in the arts (Vol. Research Division Report #36). Santa Ana CA: National Endowment for the Arts/Seven Locks Press. DeVeaux, S. (1995). Jazz in America: who’s listening? Carson, Ca: National Endowment for the Arts/ Seven Locks Press. Douglas, M. (2002/1966). Purity and danger: an analysis of concept of pollution and taboo with a new preface by the author. London: Routledge & Keegan Paul. McKeage, K. (2004). Gender and participation in high school and college instrumental jazz ensembles. Journal of Research in Music Education, 52(4), 343-356. So your first point suggests that educators might be encouraging fear of improvisation, but doesn’t explain why girls would experience greater fear of improvising than boys? You’ve said that everyone fears improvisation so I don’t understand how that links back to your premise. You go on to say that girls are choosing instruments that don’t belong in jazz bands. As far as I know, no one is forcing girls to pick particular instruments, it’s a free market of choice. So why would that be a problem. Should we have quotas for the number of girls playing trombone or saxophone? Personally, I think everyone should have the choice to pick whichever instrument they please. And if girls like clarinets and flutes so be it, leave them be. Your next point suggests that men are harassing an excluding women from Jazz, however your only evidence is anecdotal. Could it be that the best jazz players of history happen to be male? Also the references you made to audiences and consumers of jazz music being predominantly male should tell you that most women aren’t into jazz. By their own free market choices, the majority of women do not like jazz. Why is this a problem? Again I say let women have free choice. If they don’t like jazz so be it. You conclude that the jazz market must therefore be excluding 50% of all listeners from their market (women). But this doesn’t make any sense. The sellers don’t choose who the market are. The buyers do. If more men are buying jazz then the industry will market towards men. You go on to explain that teaching improvisation as a skill not a feeling will encourage more girls to learn jazz. But who is teaching improvisation as a feeling? No evidence. Teachers teach skills. For example, improvisation. “You won’t stop people from having emotions, but you can stop them developing the facility to express them” what does this mean, I’m genuinely puzzled? Another solution you offer is to accept non-standard instruments into standard jazz band ensembles. I think this is fine at a school age level where numbers may be an issue, but at a high school to professional level, the music needs to sound good. And we’ve had a number of years to figure out exactly what good jazz sounds like. You can’t just change the way the music sounds, if you want to do that you have to create something new. That would be like having a Brass Band with flutes or a String Quartet with Tuba. It isn’t what it was suppposed to be anymore, it’s something new. And that’s fine. But it ain’t jazz. And finally, blaming men. It’s men’s fault that there aren’t enough women in jazz. It’s because men are harassing them and objectifying them and fearing them. Give me a break, total lack of evidence in your piece for these claims. I agree with you, we shouldn’t care about gender, the best players should get the best jobs and rise above. Every judgement should be based on merit irrespective of gender. The most surprising thing about your article is it doesn’t actually contain a statistic for the number of boys/girls in jazz education, despite the title implying that there is an imbalance. I would have thought this would be an important piece of information for an article that leans on that one claim. I’m not suggesting that there isn’t an imbalance, I’m just surprised it wasn’t included.